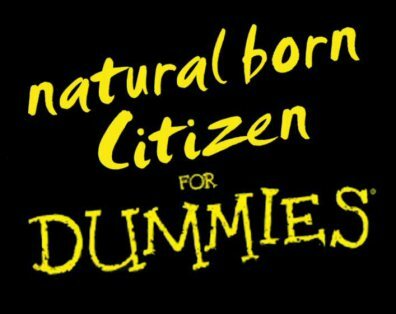 History buffs can argue until the cows come home about what the term “natural born citizen” means. The concept of citizenship has changed somewhat since the Constitution was written. Women did not enjoy full citizenship when the constitution was framed and were not able to confer citizenship to foreign-born children. Dual citizenship was not recognized in those days. Such things create wiggle room for people to argue the point. Also, who trusts the current, politically-correct courts to rule on what the concept means, if they would even take up the question. Fortunately, this is an aspect of the Constitution that voters can enforce themselves, if they choose to do so. At least patriots can enforce it on the conservative side. The Leftists may do what they want, though we should fight it. It will likely backfire on them in the long run, if they nominate people of dubious eligibility, as they did with Obama. Just do not vote for those you think are not constitutionally eligible. You do not need to understand the fancy legal arguments. Anyone with a lick of common sense knows that the Framers intended for the President to be an American citizen from birth, who was born of a real American family and did not have any claim to citizenship of any other nation. If their many ineligible candidates lose miserably, the Republicans will eventually get the message and may even start trying to enforce the requirement for Democrats. Suggest the following simple but strong rules for determining the constitutional eligibility of a candidate for the presidency or vice-presidency. The candidate must satisfy both of these conditions. The Constitution cannot apply just to those candidates, whom you do not like (like Obama). To survive, the Constitution has to apply to everyone, even those you might otherwise like and support. It also has to have the strong support of the American people. The integrity of the Constitution is more important than the success of any one candidate, no matter who he is.